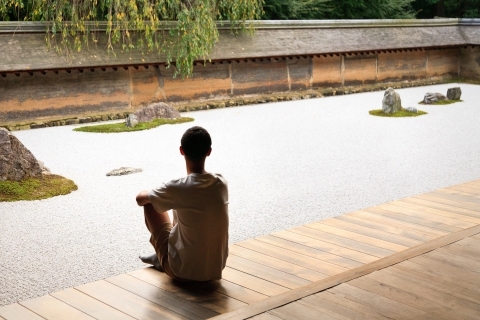 Rock Garden Ryoanji – the world-famous garden of the Ryoanji Buddhist temple (Temple of dormant Dragon) in Kyoto. Garden Reandzi stones raises many questions: what is its purpose, how it reflects the philosophy of Zen Buddhism exactly when was it created?It is still unknown when creating Reandzi – most researchers argue that this XV century, however, in the form in which Rock Garden is presented now, it exists only at the end of the XVIII century .. 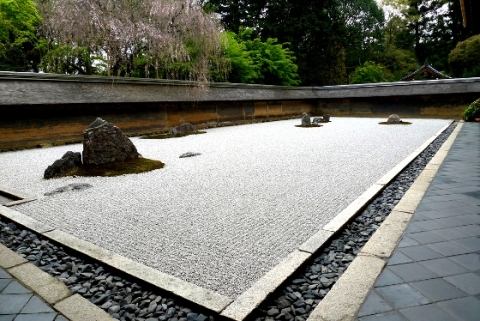 But what is the meaning of 15 black and brown stones of different shapes and size, arranged according to a certain scheme on a large rectangular area gravel? The answer to this question can not give one. Each sees in the rocks something different: a mountain landscape, clouds floating in the sky, island in the sea. Just know one thing: Garden Ryoanji – this is the best extant specimens of “dry landscape” (kare Sanz). Everyone who comes into the garden Reandzi, trying to find the point at which the open view of the mysterious 15 stone. But the majority, despite all efforts, could find only 14. The difficulty lies in the fact that it is impossible to get around the garden: a garden on three sides is surrounded by a wall, with the fourth – verandah of the temple, from which you can admire Reandzi. It is believed that the man, who saw 15 stone reaches enlightenment.